For a local search strategy, your Google My Business (GMB) listing is your company’s most visible asset. According to a recent BrightLocal survey, local search and organic search deliver the greatest ROI for businesses over any other digital marketing tactic. There are only a small few who still “search the internet.” Now, the majority of us “Google” when we are searching online and this shift has been beneficial to both consumers and businesses. Google has given you control of what searchers see when they search for your business and the opportunity to rank higher in relevant search results. The first step to optimizing your Google My Business listing is to claim it if you haven’t already! GMB is a free and user-friendly tool where you can manage your financial planning business’ digital presence for both Google Search and Google Maps. If you already have a Google account, you can use this to claim your business listing. If you don’t have a Google or Gmail account, you’ll have to go through the process of creating one first in order to claim your business listing. By utilizing this platform, you can choose what Google users see when they search for your business, as well as better understand your customers and prospects through insights on how they search for you and from where. By creating a GMB page, you ultimately enhance your SEO, local search, brand, and overall business. To claim your GMB page, visit google.com/business and go through the verification process. 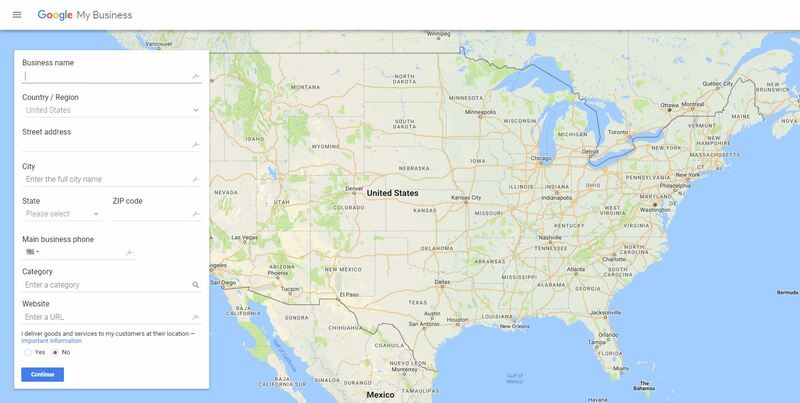 Google will send you a postcard with a unique PIN number to your firm’s physical location. Working with many advisors we realize that a large majority of practices are remote and use a PO or UPS box. It’s important to note that PO and UPS boxes are strictly prohibited by Google. Instead, when claiming your account use your personal home address. Don’t worry – this can be masked or hidden in your business listing once verified. This first step is one of the most important steps in optimizing your GMB listing. It may seem tedious but it is extremely necessary as this is how Google is able to verify that businesses are legitimate. Categories are used to describe your business and connect you to customers searching for the services you offer. By categorizing your business appropriately, you are increasing your chances of appearing in the top results for relevant searches, which can aid in gaining new clients. Google auto populates these categories so you won’t be able to create your own, however, they offer plenty specific categories for the financial services industry. You can choose from options such as “financial planner” and “financial consultant” to describe your work. Keep in mind that your primary category should describe your overall business. You will be able to add additional categories to describe more specific services and products to those searching. 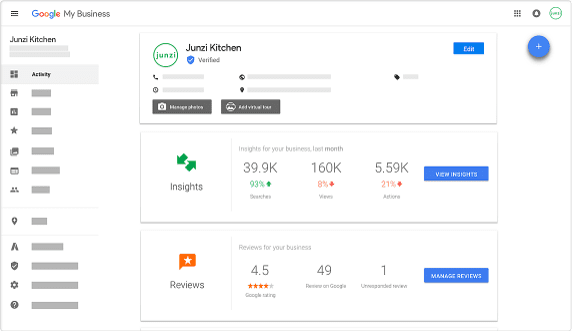 In addition to categories, As of March 2018 businesses now also have the ability to add a business description to their Google My Business listing. 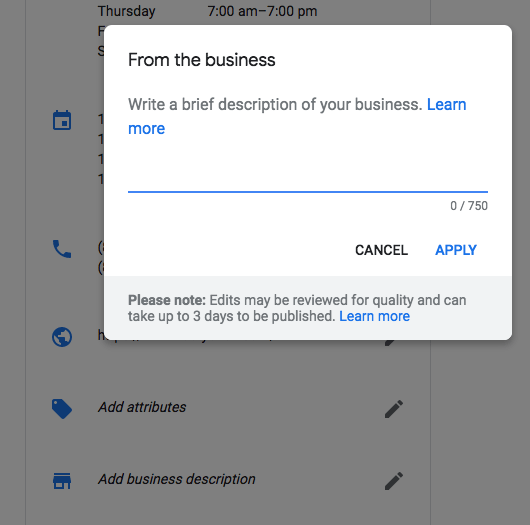 This short business description will show up in the local knowledge panel in search or in Google Maps results for the business. Once logged into your Google My Business account, click on the “Info” button on the menu bar to the left. You’ll then see that one of the new sections is labeled “Add business description.” Click on the pencil icon next to that field, and a menu will come up letting you enter a brief description of your business. You’ll have to be brief here as you only have 750 characters to work with. 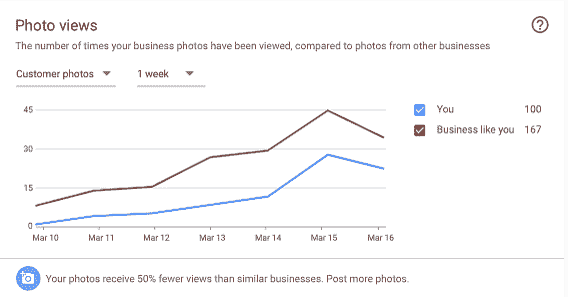 There is no doubt that photos are more engaging than text, and therefore they should be a must on your GMB page. In fact, businesses that use photos on their listing recieve 35% more clicks through to their websites than businesses that don’t. A picture truly is worth a thousand words and can convey many characteristics of your business that text cannot. Is this team professional? Is the office inviting? What will it be like to work with this firm? Use images to convey your brand and answer these questions in a different way. You should load high quality photos into GMB that reflect your professionalism. These pictures should capture your team’s personality, your work setting, as well as the interior and exterior of your office space. This is a great way to encourage virtual visitors to get to know you and your business. 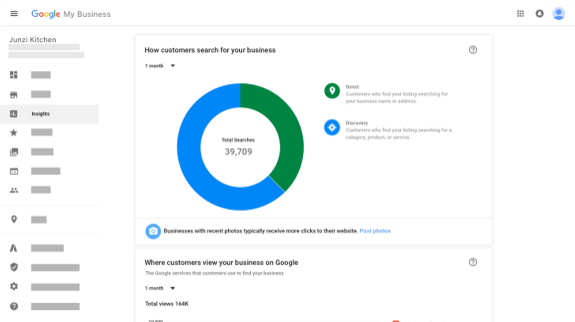 Because we know the impact photos have in marketing a financial services business, we recommend adding at least 3-6 photos to your Google My Business listing for optimal performance. GMB now also offers virtual tours so you can also consider hiring a Google approved photographer to create a 360degree virtual tour of your space for prospects. When you are first creating a GMB page, Google will ask you to search for your business. If your business is already listed, make sure you claim it as your own. This ensures you are not duplicating your efforts or your locations. Another way to localize your GMB page is to list a phone number with a local area code. Not only does this allow GMB to validate your listing, but it also appeals to local prospects who may be more inclined to work with local financial advisors. Lastly, your NAP (name, address, and phone) and listing information should be consistent across all online platforms. This includes GMB, your website, and social media. This is incredibly important for GMB and your target audience. How often do you check reviews online? Every time I am looking for a new restaurant or buying a product on Amazon, reviews are my savoir! If prospects are interested in working with your firm, housing reviews on your GMB can be a great way to build trust and give them a more personal testimony of your work. Not only do reviews help people get an idea of what it would be like to work with you, but they also help your GMB page rankings. If your page has 20 or more reviews, Google is more likely to show your page in the mapped listings over a page that doesn’t have any reviews. It seems that if an advisor has no control over the content of the third-party review, the reviewer is not compensated in any way, the advisor publishes all reviews positive and negative, and refrains from promotion on the pages where such testimonials appear, then the advisor will be in compliance. This Wealth Management post offers some great do’s and don’ts of soliciting online reviews for financial advisors. 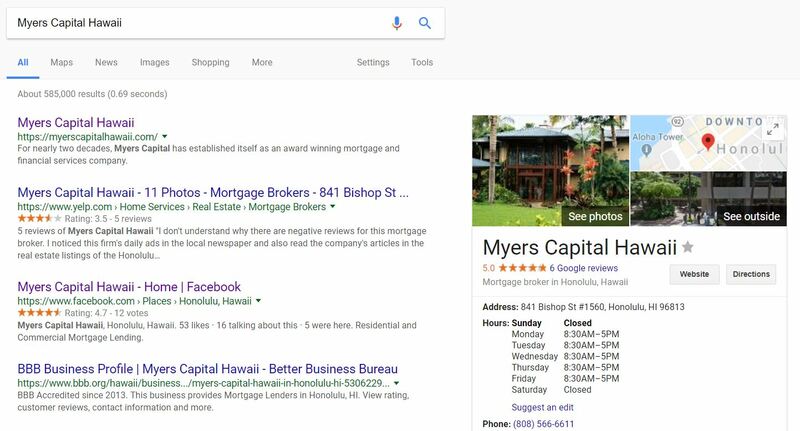 Twenty Over Ten client, Myers Capital Hawaii, has developed a GMB page with a local phone number, website, hours, images, and reviews. Let us help you maximize impact by completing the most important local SEO tasks in regards to how your website is setup and registered with Google.